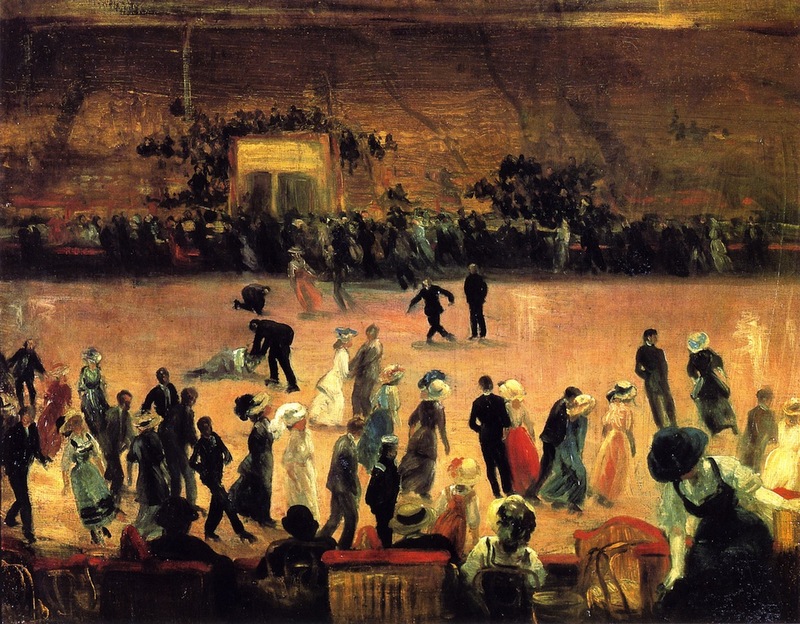 But in the late 19th and early 20th centuries, with parents at work and tenements too crowded for game-playing anyway, kids were free to roam the cityscape—running around sidewalks, playing ball in the middle of the road, or just sitting on the curb, horsing around. The street wasn’t a safe place to play, of course. Newspapers headlines of the era tell the stories of countless children being injured or killed by cars or horses. A public playground movement was underway. But by the 1910s, only 30 had been opened, and not always in the poor neighborhoods that needed them most. So park officials and the Police Athletic League came up with a novel alternative so popular, they still exist today: play streets. “Every afternoon (except on Sundays), New York City’s play streets were closed to traffic so children without easy access to parks or playgrounds could have a safe space to run, play games and practice sports,” explains Thirteen.org, the website for Channel 13. 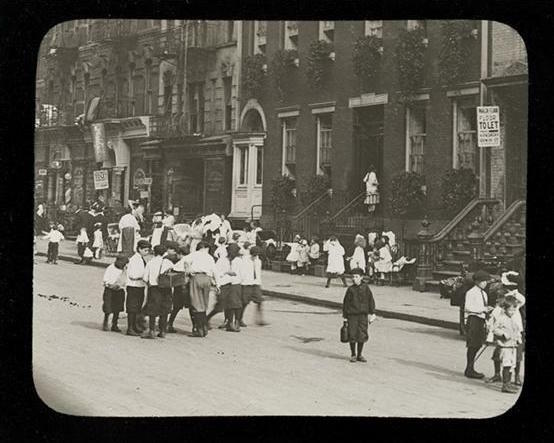 The first play street opened in July 1914 on Eldridge Street between Rivington and Delancey Streets. Signs were posted so motorists knew to drive elsewhere; vendors were shooed away. “The Parks Department brought in two of their street pianos, and the Eldridge Street Settlement organized a folk dance festival—turning a block that normally bustled with commerce into a place for music, sport and recreation,” stated Thirteen.org. 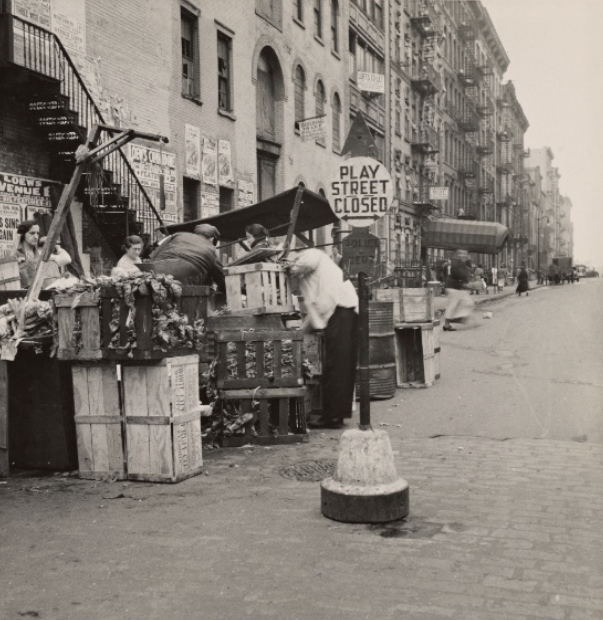 Soon, play streets began popping up everywhere, with 29 more opening in Manhattan that year. 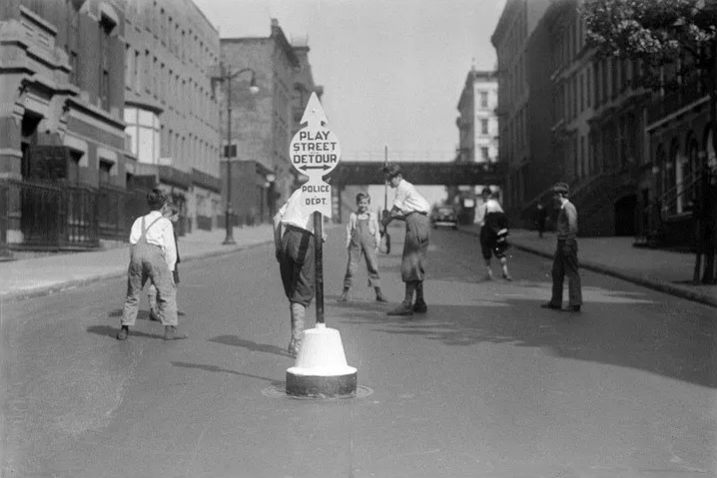 In 1924, play streets came to the outer boroughs, too. 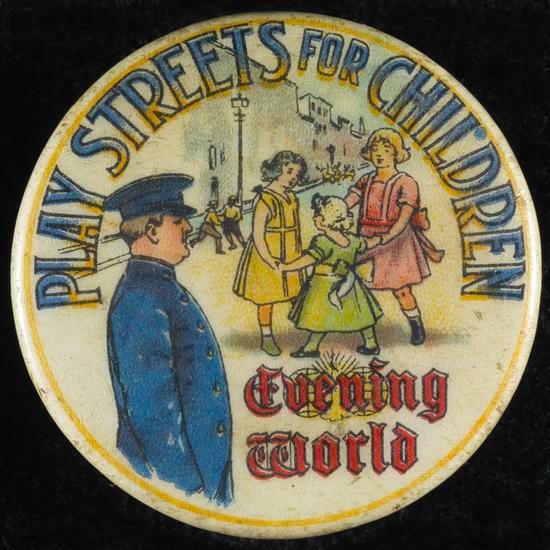 Clearly play streets were a lot of fun for kids. What could be better than running free across the block with your friends, without worrying if you’ll be crushed by horse hoofs or run over by a car? 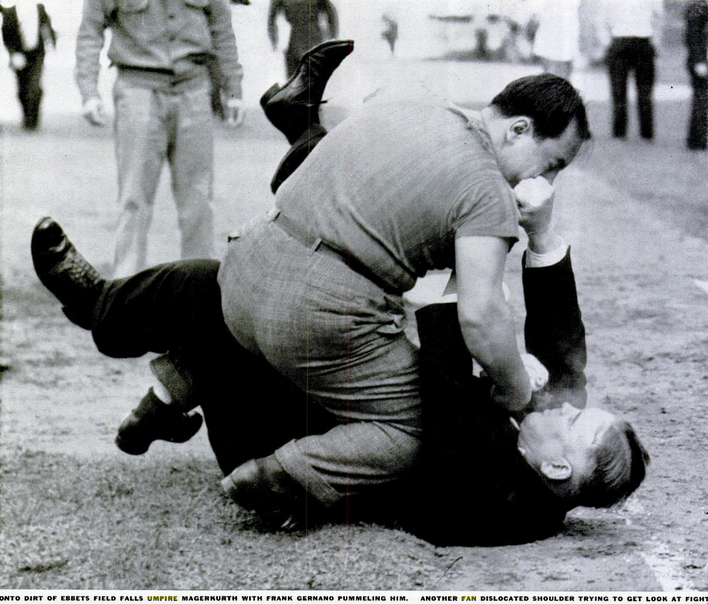 But parks officials had different motives for opening play streets. One was to prevent kids from becoming criminals. “What would these children be doing if they were not playing in the street? Many of them would be learning to become criminals,” stated a 1915 New-York Tribune article, quoting a committee of officials. “Let boys and girls become accustomed to each other. 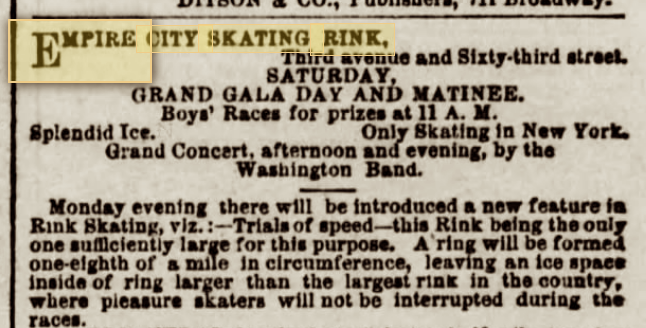 Let them think of each other as playmates and not mysterious creatures whom they may not know until they grow older, and foolish and sentimental, and much of [the] vice problem will be solved,” the newspaper quoted Charles Liebler, the organizer of the original play streets. 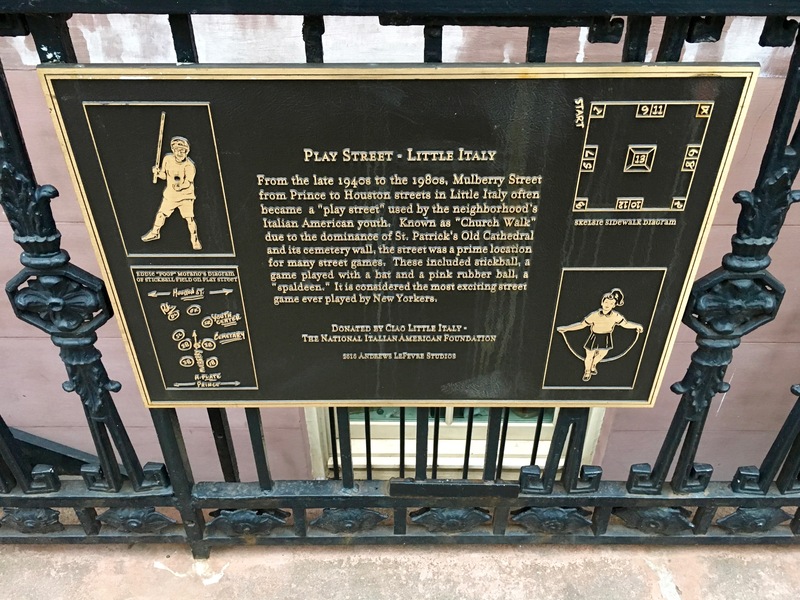 Whether the “vice problem” was solved or not, play streets and the street games kids played are memorialized in this plaque on a Mulberry Street fence. If you spent any time east of Union Square from the 1930s to the early 1990s, you might remember Julian’s, one of the last of New York’s dark and smoky billiards halls. 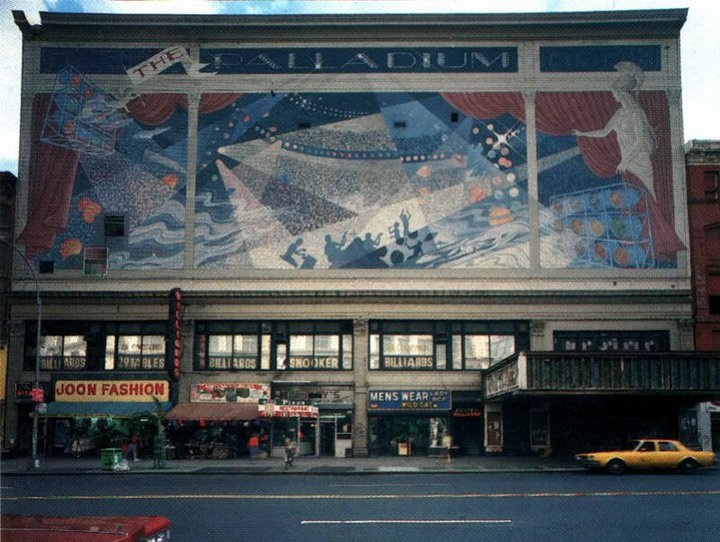 It ended its run on the second floor of the old Palladium building in 1991. 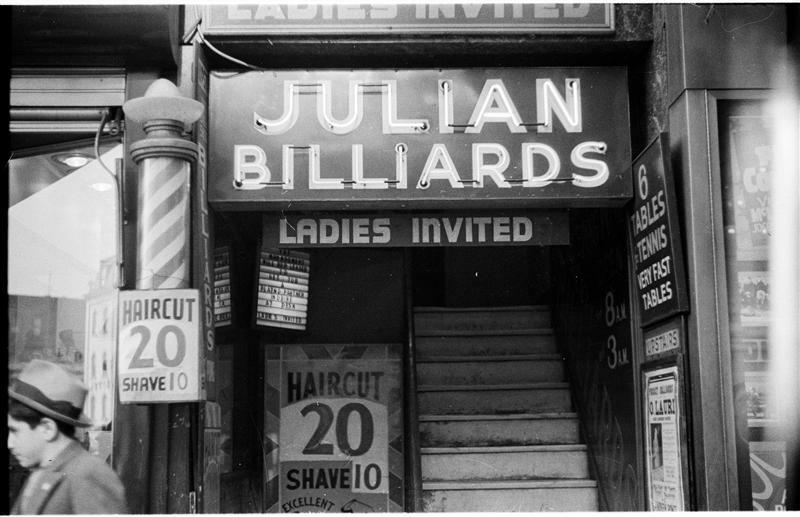 Ephemeral New York has celebrated Julian’s before, where (mostly) men and teenage boys shot pool and played hooky from work and life. But these noir-ish 1938 photos of Julian’s are another reason to bring it back again. 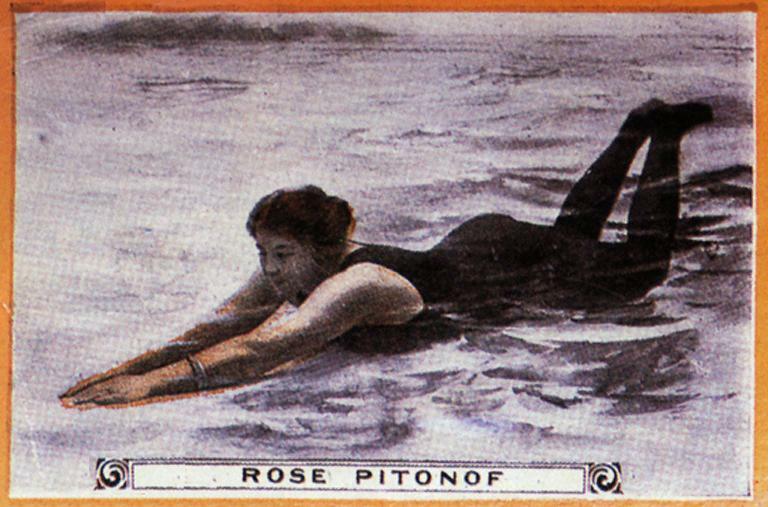 Reginald Marsh shot these images. 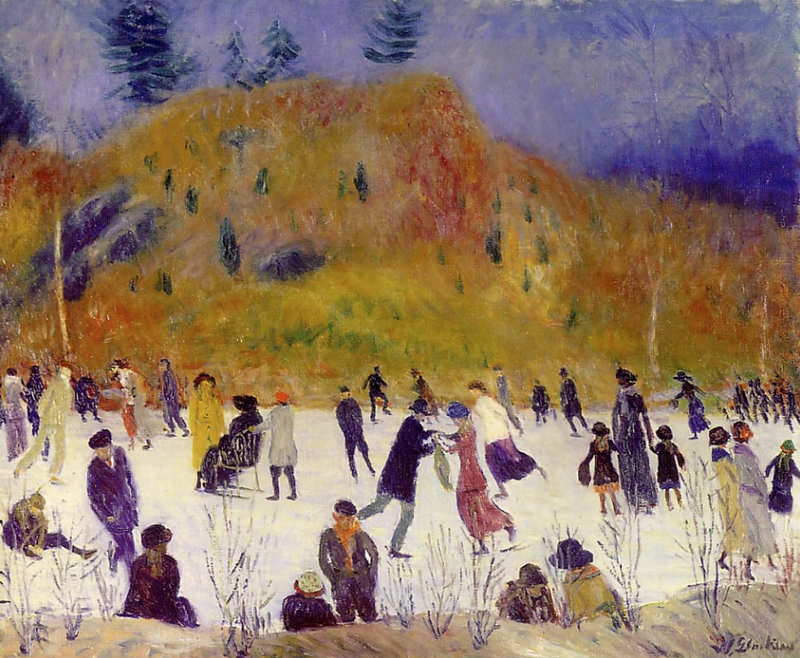 He’s better known as an artist of the 1920s to 1940s who was drawn to the city’s seedy underbelly along the Bowery, at Times Square, and on Coney Island. 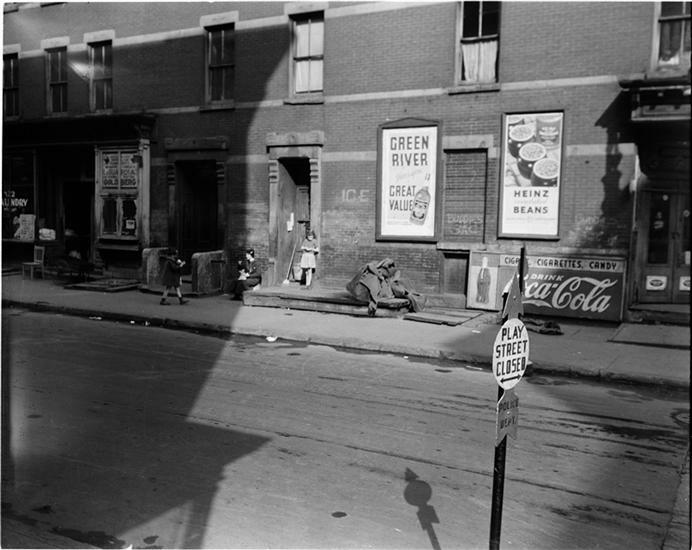 But he took a series of photos in the 1930s along 14th Street as well, capturing Depression-era New York’s grit, glamour, and many forgotten men. 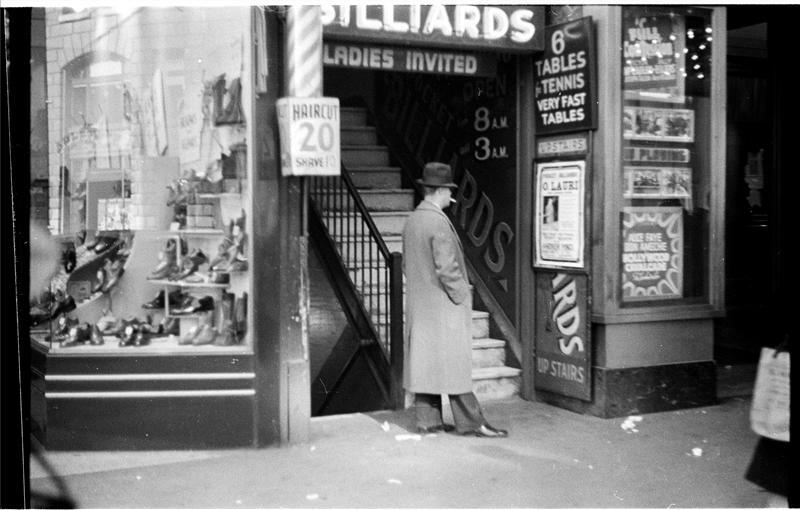 A long shadowy staircase leading to the second floor entrance, the electric sign with “ladies invited” underneath, the ad for table tennis, the barber pole advertising a cut and shave to the left . . . these photos are an invitation to 1930s New York City. (Above photo, Julian’s in the 1980s). He wasn’t just a champion heavyweight but a cultural icon of the 1920s and 1930s. So what does a cultural icon do after his days in the ring are over? Open what today’s critics might consider a celebrity theme restaurant in the busiest part of the city, of course. 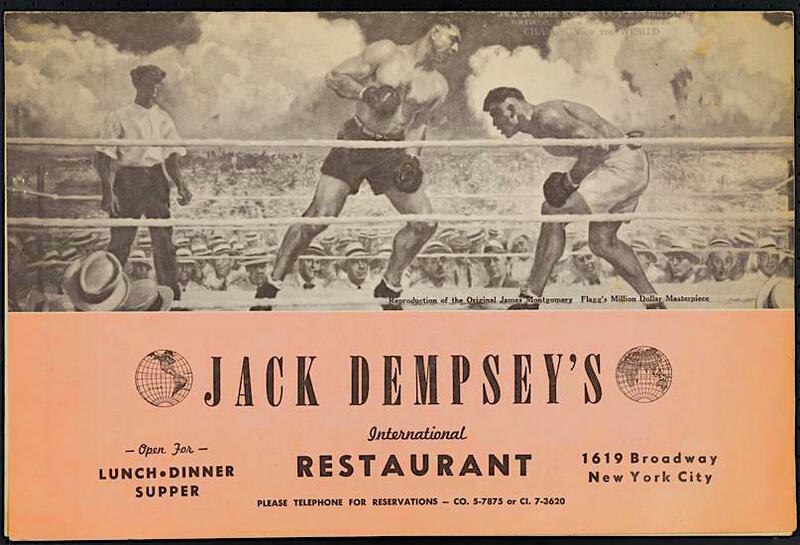 Jack Dempsey’s Broadway Restaurant, as it was officially called, opened its doors in 1935 on 49th Street, across the street from the third incarnation of Madison Square Garden. 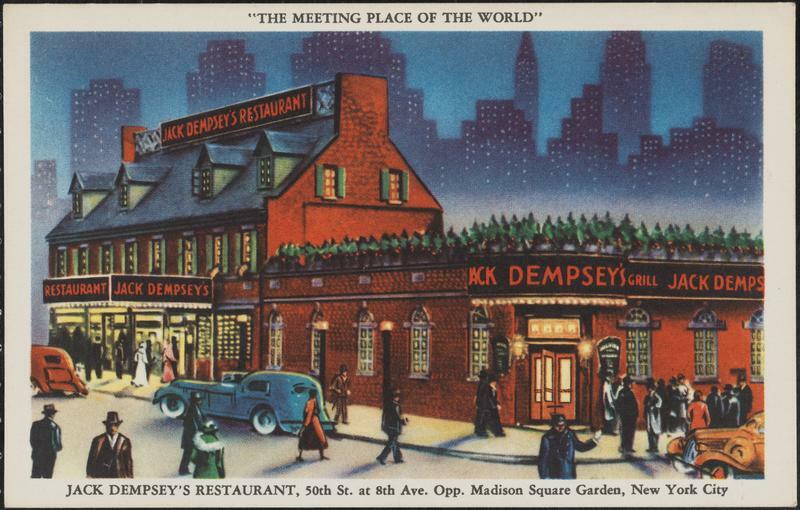 In the restaurant’s early years, Dempsey was known to hold court at a table, a legendary figure greeting customers and glad-handling guests. 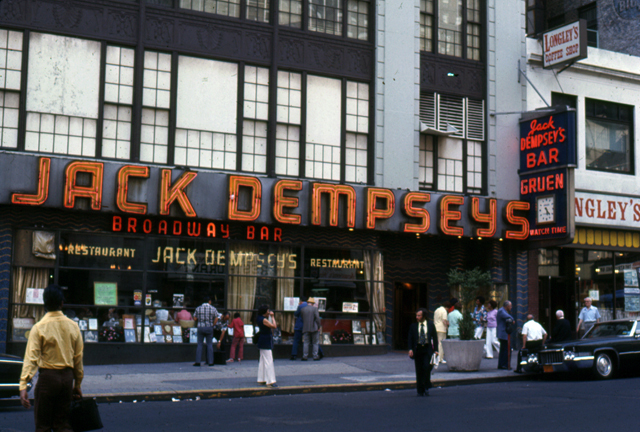 Times Square changed and the restaurant moved to the Brill Building, and eventually Dempsey’s attracted dwindling crowds. 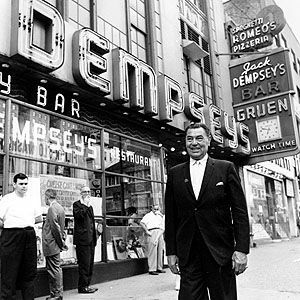 “During its waning years, Mr. Dempsey was a fixture in the corner booth, where he usually sat with his back to the window, greeting customers,” wrote the Times in 2000. In 1974, the restaurant closed after a lease dispute, its memorabilia lining the walls packed up—but not before an appearance in the first Godfather movie. 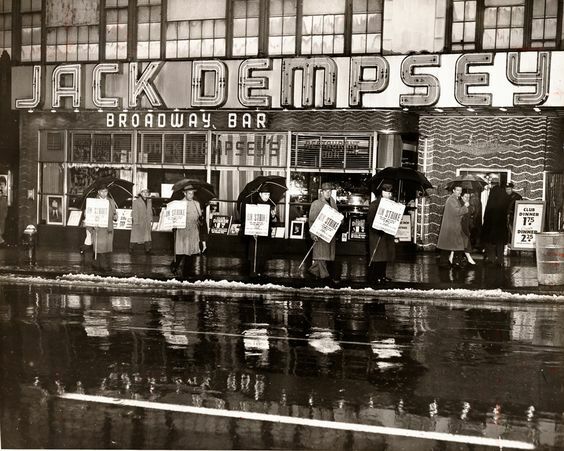 Dempsey died in 1983, and today the corner where he held court in his original restaurant on 49th Street is now named for him. 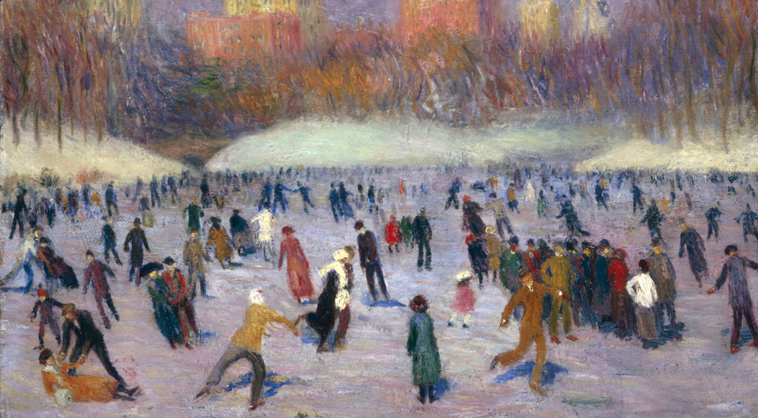 In the 1860s, New Yorkers were crazy about ice skating, and there were plenty of daytime and moonlit places to hit the ice, including Central Park and Union and Washington Ponds in Brooklyn. 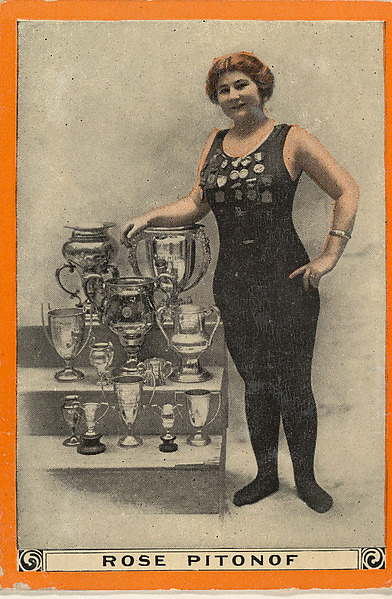 But to experience the enchantment of (temperature controlled) indoor ice skating, city residents laced up their skates and donned skating costumes at the Empire City Skating Rink, which spanned 62nd and 63rd Streets between Third and Second Avenues. 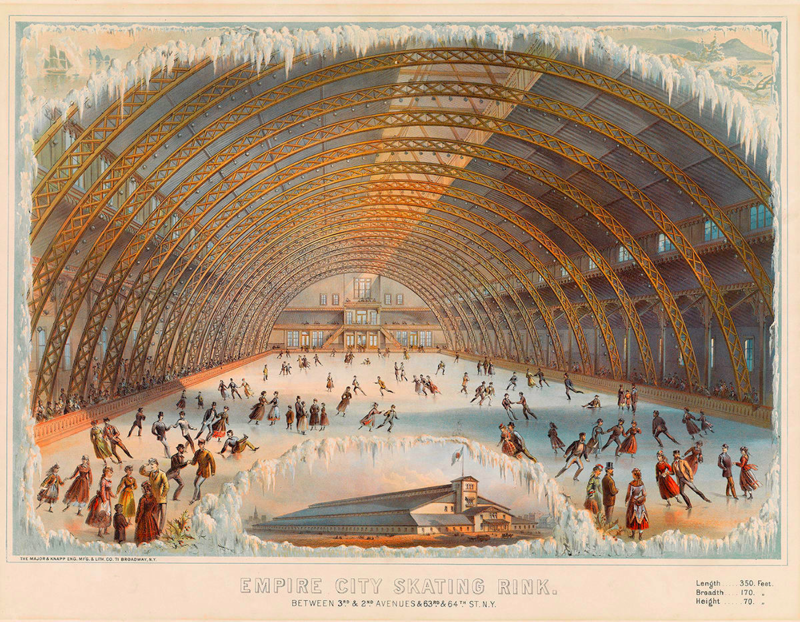 Before winter 2018 ends, consider what New Yorkers did for amusement in 1868 and see the Museum of the City of New York’s “New York on Ice” exhibit, which runs through April 15. 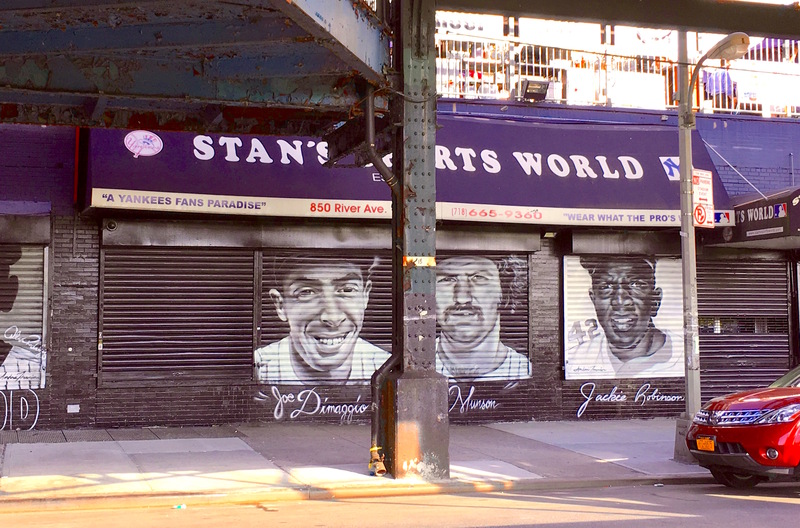 It all started with Stan’s Sports World on River Avenue in the Bronx, across the street from Yankee Stadium (the Yankee Stadium built in the 1920s, that is). Then came Stan’s Sports Bar, right next door, in 1979. 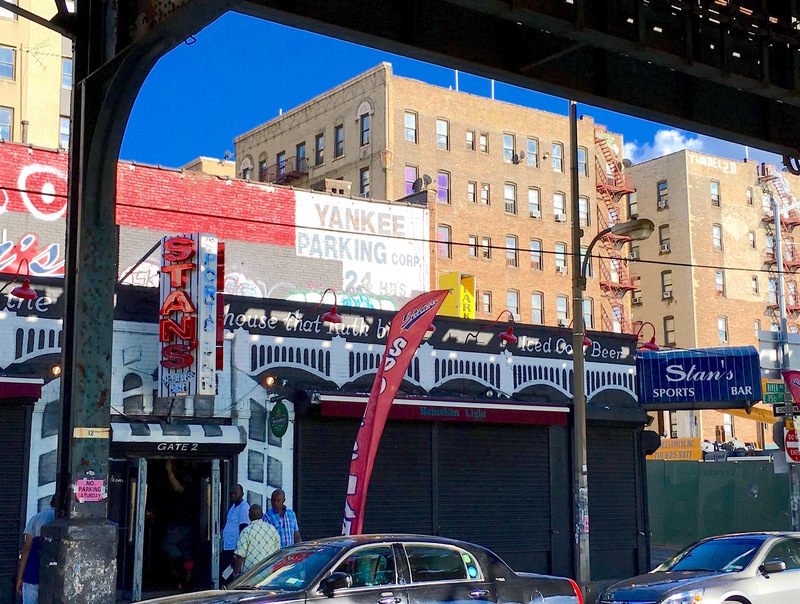 This once rough and tumble place still has its wonderful old-school neon sign, shadowed by the elevated subway tracks. 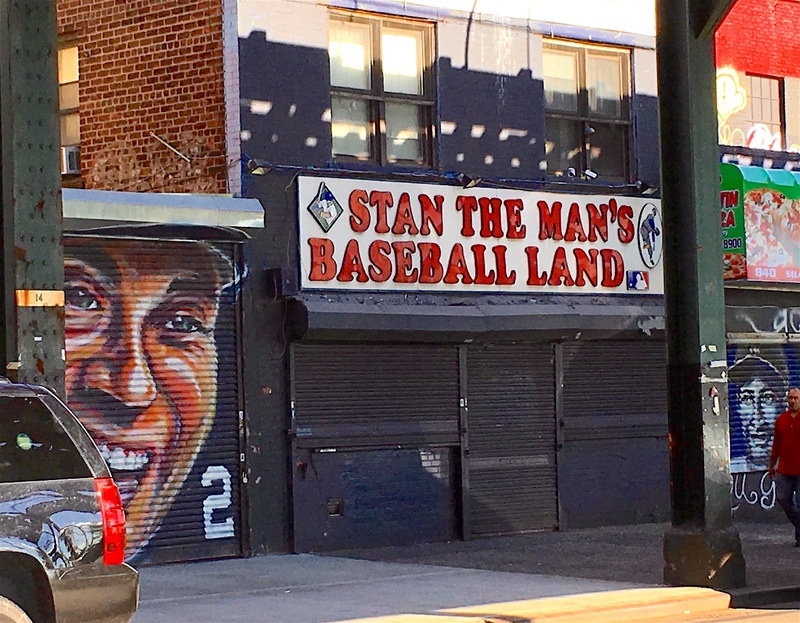 Stan was Stan Martucci, a Staten Island family man who was more of a sports memorabilia kind of guy than a bar owner, his son (who owns the place now) told a reporter in a 2009 New York Times article. The Stan’s empire expanded. There’s also Stan the Man’s Baseball Land and Stan’s Pro Cap Dugout, for official fitted MLB caps. 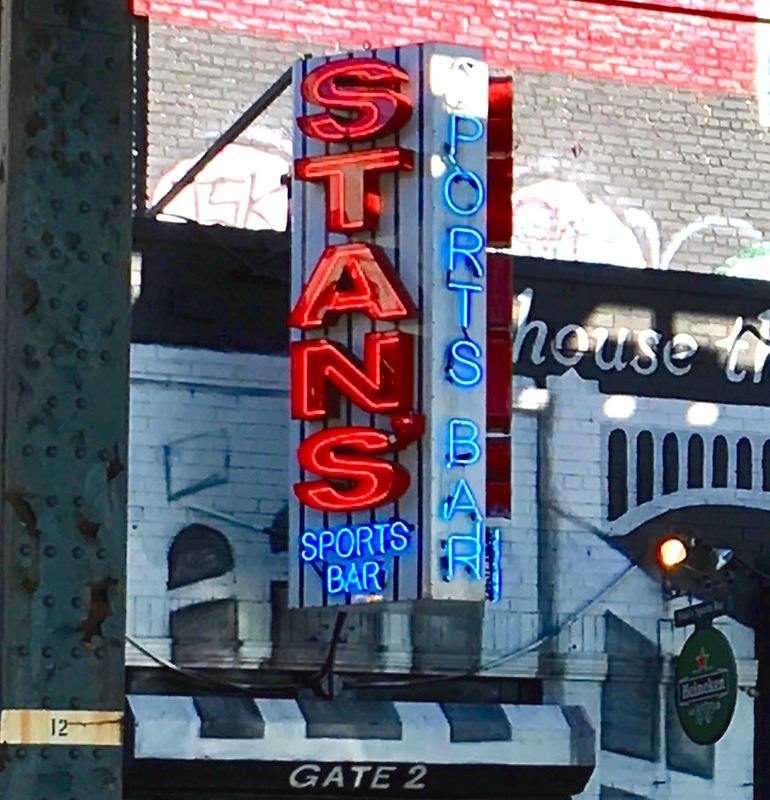 The newish stadium might be a little farther away, but for millions of Yankee fans who went to games in the gritty Bronx of the 1980s and 1990s, Stan’s is synonymous with Yankee baseball greatness. Adult-organized Little League? Uniforms? Post-game snacks supplied by parents? 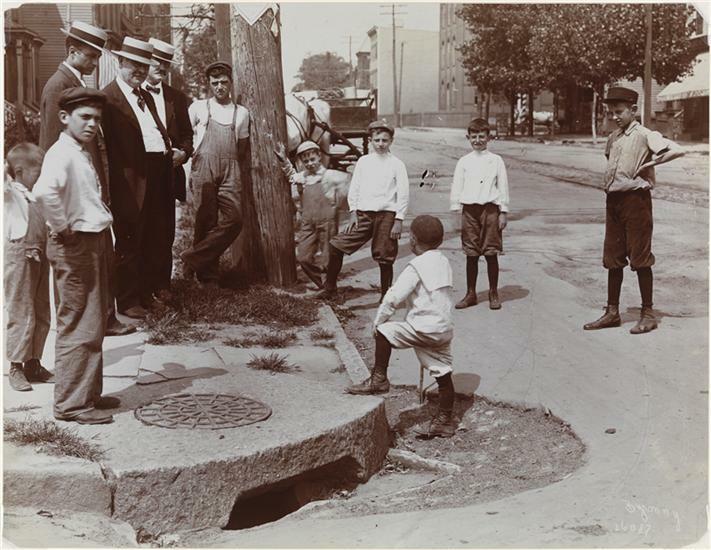 Not in New York neighborhoods like this one, where baseball-crazy (or stickball?) 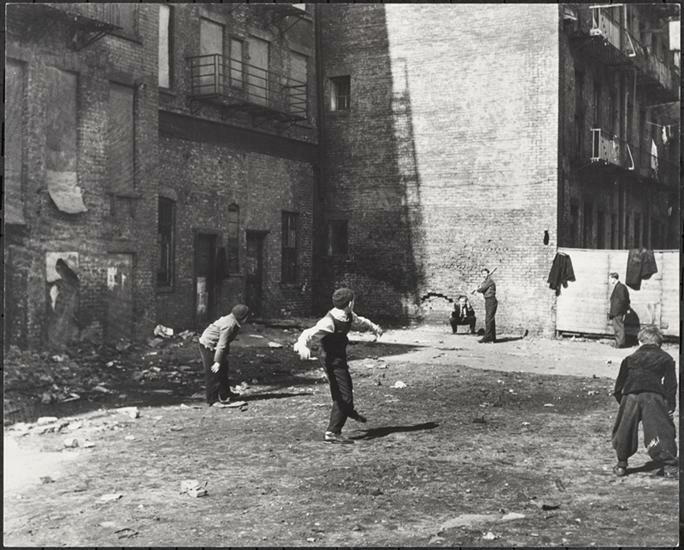 boys turned empty lots between tenements into playing fields and made rocks, cardboard, and patches of dirt their bases. This photo goes back to 1940, and judging by the long pants and shirts they’re wearing, I’m guessing it’s early in the season, as it is right now. Runners have been crossing the Central Park finish line of the New York City Marathon, cheered on by thousands of fans, since 1970. But Brooklyn beat Manhattan on the marathon front by decades. 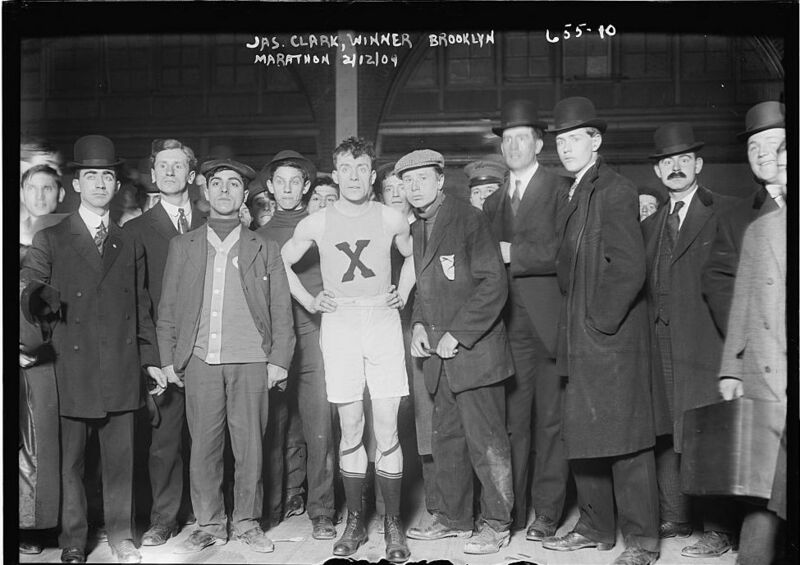 Starting in 1908, Brooklyn began holding its own marathon—on chilly February 12, President Lincoln’s birthday, no less. 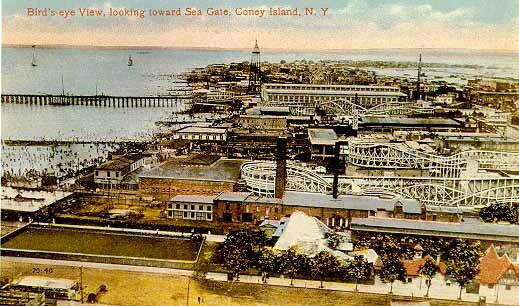 For the 1909 race, “the runners started at the Thirteenth Armory in Crown Heights, ran along Ocean Parkway, then past Coney Island’s silent amusements to Sea Gate and back, a 26-mile run,” wrote John Manbeck in Chronicles of Historic Brooklyn. 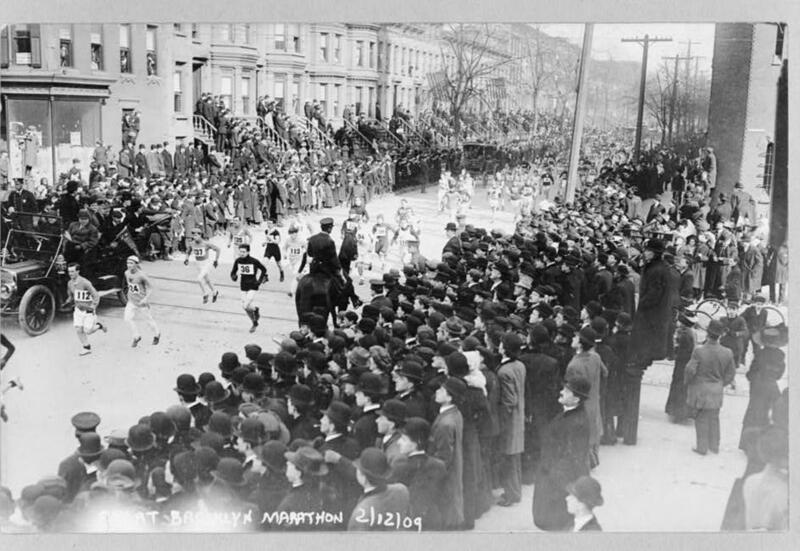 These photos from 1909 show us the 150 runners at the start being sent off by thousands of onlookers . . . and then the first and second-place winners. 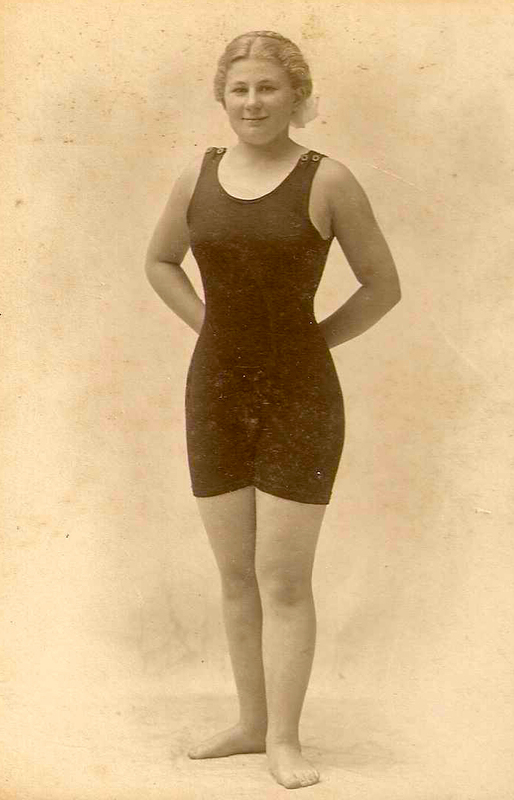 The marathon appears to have been held in fits and starts and modified versions through the 1920s, then quietly disappeared. It happened on September 16, 1940. The Brooklyn Dodgers, stuck 10 games behind first-place Cincinnati, were playing the Reds at Ebbets Field in front of 6,782 fans. 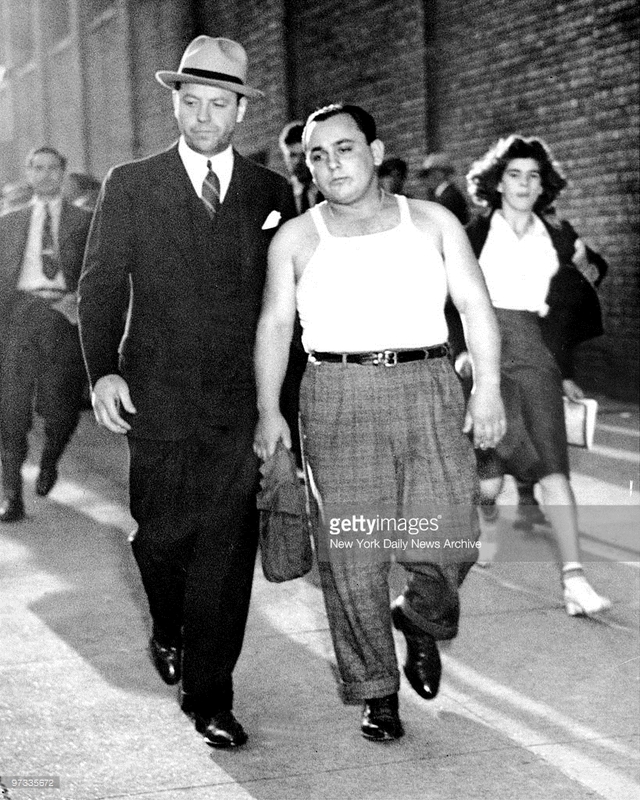 Among those fans was a 21-year-old petty criminal named Frank Germano, who lived at 128 33rd Street, opposite Green-Wood Cemetery, according to the Brooklyn Daily Eagle. 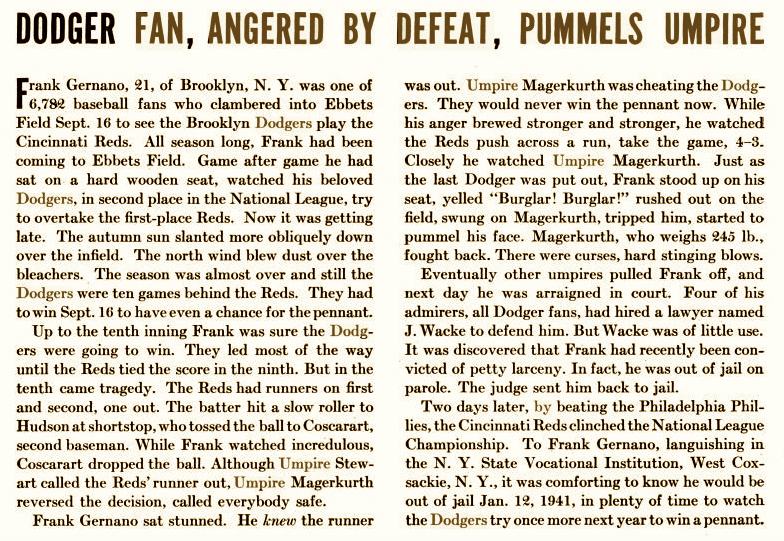 “Game after game, [Germano] had sat on a hard wooden seat, [and] watched his beloved Dodgers, in second place in the National League, try to overtake the first-place Reds,” explained Life magazine two weeks later. The Dodgers were in the lead until the Reds tied the game in the ninth. In the tenth inning, umpire George Magerkurth called two Reds runners safe after Dodger second baseman Pete Coscarart dropped the ball. Cincinnati won the game—and the Dodgers were left to finish out another pennant-less season. Eventually the two were separated by other umpires. Germano “paid for his enthusiasm by being lodged in the Raymond Street klink after his arraignment on charge of third degree assault,” wrote The Eagle. So what happened to Germano? 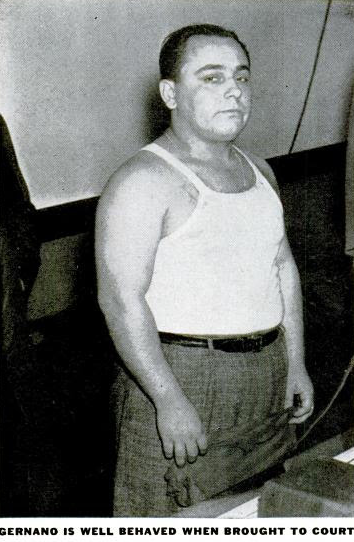 Ultimately Magerkurth decided not to press charges, and after a judge set him free in April 1941, Germano left the courthouse in Flatbush only to encounter the umpire he tackled. The two men shook hands and went their separate ways, the Eagle reported.